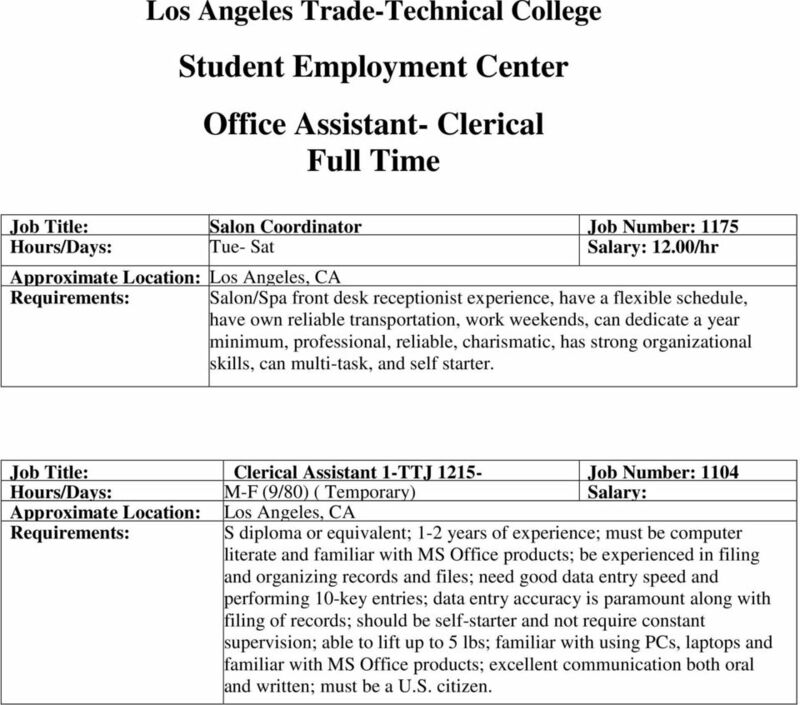 Download "Student Employment Center Office Assistant- Clerical Part Time"
1 Part Time Job Title: Help Desk Specialist Job Number: 1093 Hours/Days: M-F Part/ Full Time Salary: $14.42 Requirements: Good communications, time management, and organizational skills; ability and desire to learn quickly; ability to work well with others and continue to foster a teamwork environment; an understanding of Microsoft server platforms; an understanding of desktop/mobile platforms; an understanding of networking concepts; expert at navigating computer programs: Microsoft Windows, Microsoft Office, etc. Mac OS, Office for Mac a plus; Computer science/engineering coursework or equivalent in work experience or training and certification is a plus. Job Title: Assist Job Number: 1074 Hours/Days: Flexible Salary:$9.00 Requirements: Experience in Word and Excel and have very good organizational skills. Typing, filling, organize and set up files for a small business. Job Title: Personal Assistant Job Number: 1098 Hours/Days: Tue and Fri/ 9:00 am Noon (Temporary) Salary: TBD Requirements: Typing wpm, attention to detail, proofreading, diligent and dependable. Experience working in an office environment helpful. Entails typing, updating "to do" lists, filing, occasional faxing, and data entry input. Job Starts July 8, 2013. 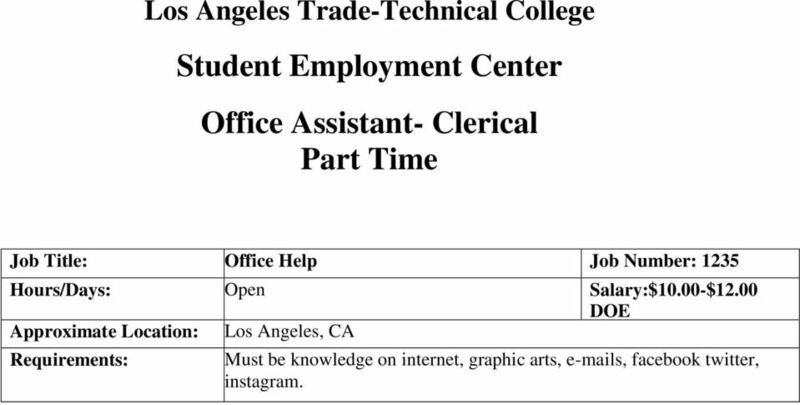 2 Part Time Job Title: Office Help Job Number: 1235 Hours/Days: Open Salary:$10.00-$12.00 DOE Requirements: Must be knowledge on internet, graphic arts, s, facebook twitter, instagram. 3 Full Time Job Title: Salon Coordinator Job Number: 1175 Hours/Days: Tue- Sat Salary: 12.00/hr Requirements: Salon/Spa front desk receptionist experience, have a flexible schedule, have own reliable transportation, work weekends, can dedicate a year minimum, professional, reliable, charismatic, has strong organizational skills, can multi-task, and self starter. 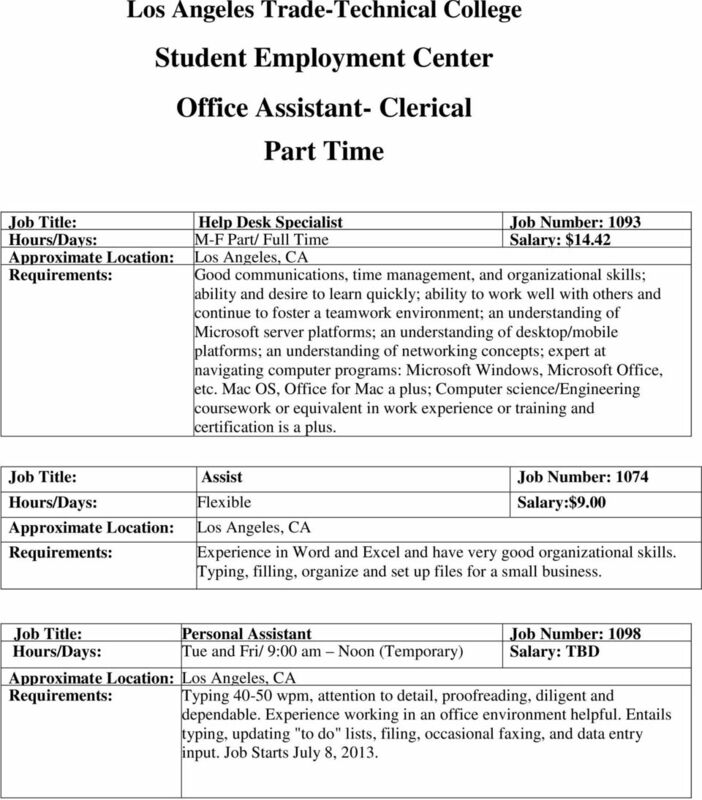 Job Title: Clerical Assistant 1-TTJ Job Number: 1104 Hours/Days: M-F (9/80) ( Temporary) Salary: Requirements: S diploma or equivalent; 1-2 years of experience; must be computer literate and familiar with MS Office products; be experienced in filing and organizing records and files; need good data entry speed and performing 10-key entries; data entry accuracy is paramount along with filing of records; should be self-starter and not require constant supervision; able to lift up to 5 lbs; familiar with using PCs, laptops and familiar with MS Office products; excellent communication both oral and written; must be a U.S. citizen. 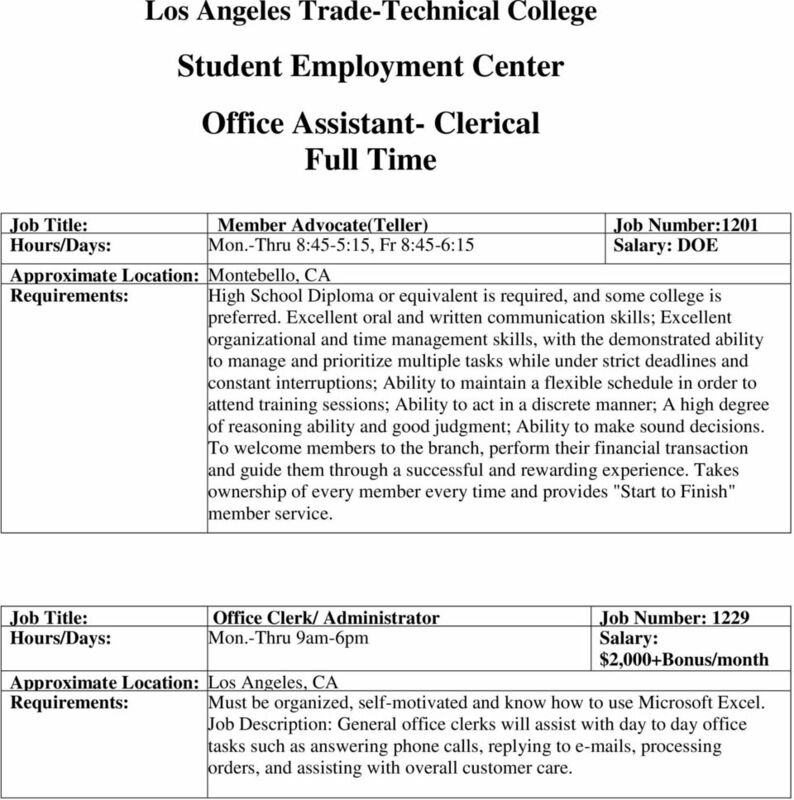 4 Full Time Job Title: Member Advocate(Teller) Job Number:1201 Hours/Days: Mon.-Thru 8:45-5:15, Fr 8:45-6:15 Salary: DOE Approximate Location: Montebello, CA Requirements: High School Diploma or equivalent is required, and some college is preferred. Excellent oral and written communication skills; Excellent organizational and time management skills, with the demonstrated ability to manage and prioritize multiple tasks while under strict deadlines and constant interruptions; Ability to maintain a flexible schedule in order to attend training sessions; Ability to act in a discrete manner; A high degree of reasoning ability and good judgment; Ability to make sound decisions. To welcome members to the branch, perform their financial transaction and guide them through a successful and rewarding experience. Takes ownership of every member every time and provides "Start to Finish" member service. Job Title: Office Clerk/ Administrator Job Number: 1229 Hours/Days: Mon.-Thru 9am-6pm Salary: $2,000+Bonus/month Requirements: Must be organized, self-motivated and know how to use Microsoft Excel. Job Description: General office clerks will assist with day to day office tasks such as answering phone calls, replying to s, processing orders, and assisting with overall customer care. 5 Full Time Job Title: Billingual Spanish- English Office Assistant Job Number: 1260 Hours/Days: Mon.-Fri. Salary: Upon Experience Requirements: The operation of personal computers and other office equipment; communication with the public and the ability to communicate effectively with diverse clientele by phone, or in person; ability to work independently on routine tasks and maintain confidentiality; operate general office equipment including fax machine, copier and multi-line phone; experience using Microsoft Word, and Excel; Knowledge of English, spelling, grammar, and basic arithmetic. Scheduling, documentation skills, meeting planning, attention to detail, administrative writing skills and strong project management experience and coordination. Job Title: Maintenance Clerk Job Number: 1282 Hours/Days: 40 hours per week Salary: Upon Experience Requirements: Skills Requirement: Must possess a minimum of two (2) years of relevant experience in a maintenance environment; technical diploma in a relevant field will be considered as an asset; possess intermediate to advanced knowledge of Microsoft Excel; possess the ability to obtain a California notary license; possess experience working with maintenance scheduling software; excellent English communication skills, Spanish communication skills considered as an asset. Job Description: Established the super user role with asset works rail focus maintenance management systems (mms) and ensure that the system is being maximized by the supervisors and team members; Coach, mentor, and train the staff; Maintain all scheduling for Preventative Maintenance and drive accountability in completion of all tasks in a timely manner; process development to deliver quantifiable data using the asset works rail focus (mms) and Microsoft Office; and retrieve onboard data recording system downloads on train equipment. 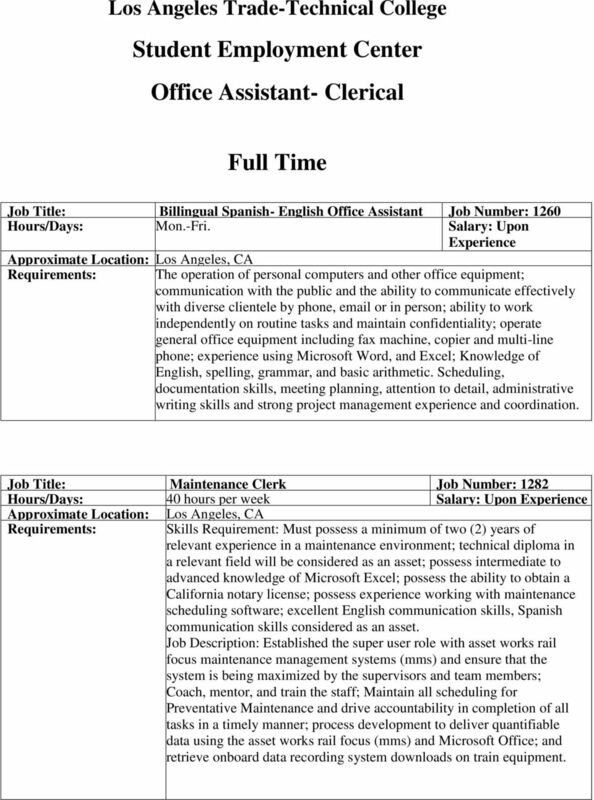 Full Time Job Title: Mechanic Job Number: 1648 Hours/Days: Mon-Fri Salary: $17.00 Downey, CA Minimum requirements: Class A Mechanic, DOT inspection qualified, DOT qualified to perform annual brake inspections. OFFICE ASSISTANT I. $3,459.33 - $4,204.75 monthly, plus excellent benefits. APPLICATION CLOSING DATE: WEDNESDAY, OCTOBER 15, 2014 at 5:00 p.m.